Everybody has been talking about the rise of AI for what feels like forever. 2016 is going to be THE year of AI. 2017 is going to be THE year of AI. Now, excitingly, 2018 is going to be THE year. And at risk of sounding like a sports fan whose team hasn’t quite won the championship ...well…this is going to be THE year of AI. It’s not just myself and the rest of the fine folk at Swrve that think this. Far from it. For example, Benedict Evans of Andreesen Horowitz thinks so too. 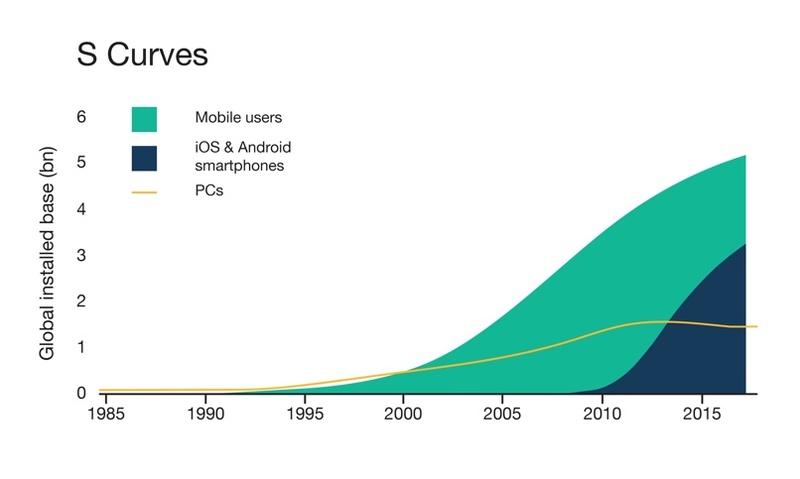 In his recent keynote at a16z’s Tech Summit, he spoke in depth about the remarkable growth trajectories of PC, mobile phones, and iOS & Android smartphones. Each technology’s growth resembles an S-curve. The early days of getting the tech to work and finding the product-market fit take place in the bottom left of the curve, followed by the ‘pouring on the rocket fuel’ phase where the technology is adopted by everyone and grows exponentially. Finally, to the top right of the S is where the rate of growth slows down, becomes more stable and the technology ‘gets a bit boring’. He argues that we are now in the top right phase of the mobile S-curve, and are innovating more in what we can build onto the platform, rather than the platform itself. And of course there is always something new coming along to change the game. Enter, stage right: AI. ‘What is all the fuss about?’ I hear you asking. Well, put simply, AI enables businesses to do things that they weren’t able to do before, through machine learning and automation. And as a result many companies have already been created to take advantage of the opportunities that AI has enabled for each specific part of each specific industry - from analytics to help doctors carry out spinal tap procedures to optimizing the quality of your tomatoes through data. And add to this enterprises interacting with their customers. The days of brands relying on broadcasting one-size-fits-all campaigns are coming to an end. Instead, we’ve all come to expect increasingly relevant and personalized interactions on a day-to-day basis. Furthermore, traditional trigger-based audience building, which resembles something like ‘User A has done Action A, so will be sent Message A’, does not reflect the full picture. This is why new technology, like Swrve Intent Engine, is genuinely exciting for enterprises. Never before have they been able to know their customers so well, by using every fragment of customer behavior - from years ago to minutes ago - to target people with the perfect message on the perfect channel. All powered, you guessed it, by automation and machine learning. So I am sure you can now see why, at Swrve, we’re really excited about 2018, and are literally dousing our offices with rocket fuel to get ready for the explosion.